Johnny Depp. Tim Burton. chocolate. Sometimes you can just be too excited about a new film. And that's always dangerous, because generally (Troy, Constantine) that's when it disappoints. 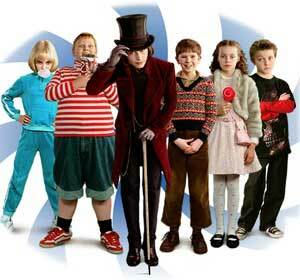 But folks, this time you can believe the hype because Charlie and the Chocolate Factory rocks. 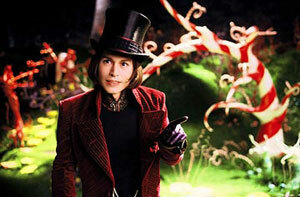 We all know the plot: nice, ordinary kid from impoverished post-war family wins golden ticket to spend day in magical chocolate factory with bonkers entrepreneur Willy Wonka. 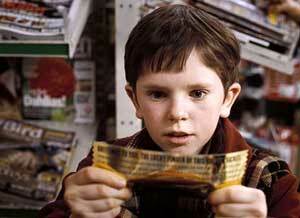 Of course, if you're only six, you probably don't know the plot - hence the heart-warming cries of delight echoing across the cinema as Charlie opens his chocolate bar to discover a glimpse of gold inside. What, did you really think he wouldn't get a ticket, and spend the rest of the film stuck outside the factory gates while the bratty kids get all the action? Because of course Charlie is not alone in his visit to the factory. With him are the clinically obese, chocolate scoffing German Augustus Gloop, spoilt little daddy's girl Veruca Salt, super-competitive over-achiever Violet Beauregard (with mum to match) and surly computer gaming whiz Mike Teavee, each destined to come to a sticky end in the chocolate factory as, like the cast of Johnny's first film, A Nightmare on Elm Street, they're picked off one by one by their sinister host. No stripy jumper and fistful of knives for Willy Wonka of course - instead he comes complete with dapper top hat and dandified velvet frock coat, shiny Cuban heels and somewhat creepy purple surgeon's gloves. Add to that a face so pale he could be Scottish, a splendid, gleaming overbite and weird bobbed hair so shiny it looks polished, and fancying Johnny Depp in this film becomes as deliciously perverse as his candy creations. Stuck firmly in the 1960s, he's like a cross between Austin Powers and Edward Scissorhands, skipping about in his own private Neverland like manic junkie journalist Raoul Duke in a drugstore. Bitter sweet and definitely nuts, there's a nasty streak running through him a mile wide, and yet inside there's a soft centre just waiting to melt. Because this Willy Wonka, unlike Roald Dahl's original creation, comes with that vital attribute that children really can't give a chocolate coated fig about but we adults love so much: a backstory. 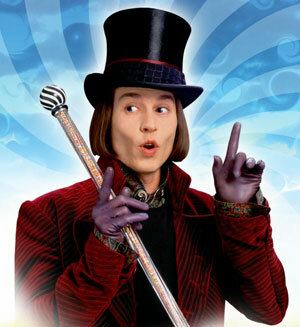 How, Burton asks, does anyone become Willy Wonka, a mega-successful, reclusive candy-making genius? The answer: by growing up sporting a hideous dental brace that encompasses his entire head, banned from ever eating chocolate by his fierce dentist father, Wilbur Wonka, aka the marvellous Christopher Lee. Convinced? Well, the fact that I get to see Christopher Lee playing Johnny's dad is enough to sell it to me, but as an add in I think it works very well, and is thoroughly in keeping with Dahl's dark story. And the flag bit (you'll know it when you see it) is just genius. But what of Roald Dahl himself? The curmudgeonly author famously hated the 1970s adaptation of his book, starring Gene Wilder as a woolly-haired Wonka, so what would he have made of this new version? His wife Felicity believes he'd have loved it - so who am I to disagree? And surely no-one can be closer to Dahl's disturbing and dangerous vision, his macabre and mischievous style, than Tim Burton, the king of creepiness and god of gothic himself. From the picturesque poverty of the Bucket household, complete with watery cabbage soup and bedridden grandparents (Liz Smith is a joy, incidentally), to the incinerated puppets that greet the five lucky winners (hooray! The 'It's A Small World' ride at Disneyland is one of the most traumatic experiences of my life.) to the fantastic, lollipop-littered, sticky sweet sugarscapes and mad scientist machinery inside the factory itself, Charlie and the Chocolate Factory is visually stunning, endlessly inventive and deliciously quirky - in short, everything you ever dreamed it could be when you were ten. And then there are the Oompa Loompas. Yes, perhaps the idea of transporting an entire indigenous population from their (albeit exceedingly perilous) homeland, imprisoning them in a factory and paying them in cocoa beans is not awfully politically correct and I'm sure Immigration would have something to say about it if they ever found out, but at least in this film, they're not orange. Instead, thanks to the wonders of modern technology, vertically challenged actor Deep Roy plays not one but all of the all-singing, all-dancing Oompa Loompas, and is just brilliant - the only character who comes close to stealing Johnny's thunder. Just wait for the moment when the Oompa Loompas take on the Darkness - I thought I was going to die laughing. Brilliant visuals, a fab score from Danny Elfman, an excellent supporting cast (besides Christopher Lee, little Freddie Highmore is delightful and not at all annoying as Charlie Bucket, David Kelly makes a marvellously endearing Grandpa Joe, and James Fox is perfect as Veruca's stiff-necked father) and a superstar turn from Johnny, this is Tim Burton at his very best. Okay, so the ending is a little sickly sweet, but by that point I was willing to forgive anything. A sugar spun confection of perfection that'll leaving you as high as a bagful of fizzy cola bottles, Charlie and the Chocolate Factory is madly entertaining, completely hilarious, gorgeously heart-warming and just delicious. And I am so going back for second helpings.